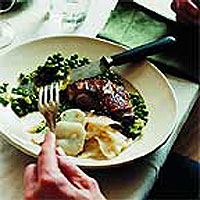 Waitrose Free Range duck breasts are lean and tender and require little preparation. Tying them together keeps the meat succulent and the skin crisp. Trim any loose skin from the duck breasts. Score the skin of each breast 3 or 4 times with a sharp knife. Place in a large, shallow, non-metal bowl with the orange juice, port, peppercorns and ginger. Turn each breast to coat in the marinade. Cover, chill and marinate, skin-side up, for at least 2 hours. To make the sauce, place the shallots, garlic, stock and soya sauce in a pan. Simmer for 10 minutes or until the shallots have softened. Remove from heat and reserve. Remove duck breasts from the marinade and reserve this. Pat the skins dry with kitchen paper and season all over. Sandwich the duck breasts together in pairs with the skin sides facing out. Tie together using two loops of kitchen string to form a neat 'parcel'. Chill until ready to cook. Heat the oil in a large frying pan over a medium to low heat. Add the duck breasts and cook for 15 minutes. Drain the fat from the pan, turn the breasts over, season again and cook the other side for about 12 minutes until ready - reduce the heat if necessary. Drain the fat from the pan and remove from the heat. Cover tightly, keep warm and rest for 5-10 minutes. While the duck is cooking, add the reserved marinade to the sauce. Simmer over a low heat for 12-15 minutes. Press the sauce through a fine sieve, then whisk in the chilled butter - the sauce should be smooth and glossy. Remove and discard the strings from the duck. Place the breasts, skin-sides up, on 6 warmed plates. Pour a little sauce over and garnish with parsley. Serve the rest of the sauce in a warmed sauce boat. If you prefer your duck well cooked, increase the cooking time by 4-5 minutes. Ready-made short cut Bigham's Breton Chicken with a Fresh Chive Mornay Sauce, and bacon lardons, leeks and parsley.